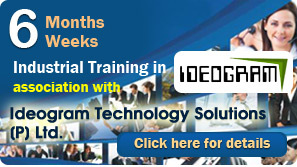 The Course Focuses on Training Students to become Complete Software Engineers & Profe- ssionals. In this course, you analyze, design, implement and test applications that meet user. The Java training program from ActIT is designed for programmers who want to add the Java programming language to their skill set and for students who are preparing for the SCJP exam. Very few institutes providing Web Designing training at Industrial Level expertise. We have built a repo of creating industry ready professionals for Web Designing. C is a structured, procedural programming language that has been widely used both for operating systems and applications and that has had a wide following in the academic community. LIVE PROJECTS - The students work on live projects rather than dummy projects. Projects which have been done with our clients are the projects on which the student works. NO HIRED TEACHING FACULTY - The strength for the success lies in the strong hands of the educationalist so for that all the classes are taught by Mr Rahul Pandit. PLACEMENTS - 100% job assistance is provided to students. Dedicated placement cell is present to assure that the right student gets the right kind of job depending upon his technical capabilities. LABS - Air conditioned labs with high level of hygiene plus 10 project trainers who possess core competencies in IT industry to guide the students in their practical work and project making.